Plantar Fasciitis (pronounced PLAN-tar fashee-EYE-tiss) is an inflammation of the fascia ligament in your foot. The plantar fascia ligament is located at the bottom of your foot. It is attached to the heal and extends to the ball of the foot. Plantar Fasciitis is common in runners and other athletes, and people who have jobs that require a large amount of walking or standing. People with plantar fasciitis often have tight Achilles tendons and calf muscles. Plantar fasciitis usually develops gradually but can have an acute onset. The most common symptom is intense pain located in the centre or the inner side of the bottom of the heel. The pain is most intense when first standing and after resting. The pain is most severe when first standing and after resting because the foot tries to heal itself when it is in a contracted position. Some other symptoms are tight foot and swelling. Extra weight cause the arches of the foot to sag. 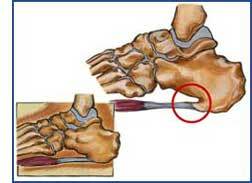 Sagging arches causes the plantar fascia to be overly stretched. Flat feet is a condition where the inner sole of the foot contacts the ground. Flat feet causes plantar fasciitis by overly stretching the plantar fasciia. It takes between 6 to 12 months to heal. However, most people recover in about 6 months. Yes. Run on soft surfaces, don't increase running by more than 10% each week and maintain a healthy weight. Also, make sure you wear a shoe that fits your foot type and gait.